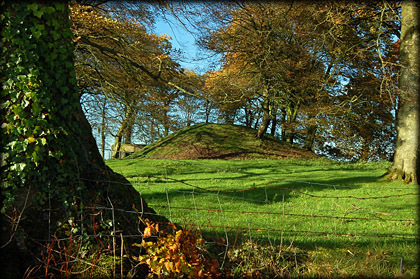 This rather attractive motte stands on the top of Drumcooly Hill. Sadly I was unable to get close to the motte due to barbed wire and electric fencing. The Motte was probably built around the beginning of the 12th century and there is still a bailey connected with it, although a modern road is said to cut through the bailey. The castle would certainly have had commanding views of the surrounding area. It was protected on the south side by the Bog of Allen. A togher was built across the bog to be used as an escape route during troubled times. This is a very picturesque motte and is worth a visit. Situated: From Edenderry take the R401 south. Take the second left sign-posted Drumcooly cemetery. At the T-junction turn left. The motte can be seen on your left. Discovery Map 49: N 6265 3060. Last visit Nov 2011.